I just love strawberry season! When I was a kid my mom used to take us out of school early one afternoon in May and take us strawberry picking. I ate my weight in berries and rode home with red fingers and stained lips. I looked forward to it every year! 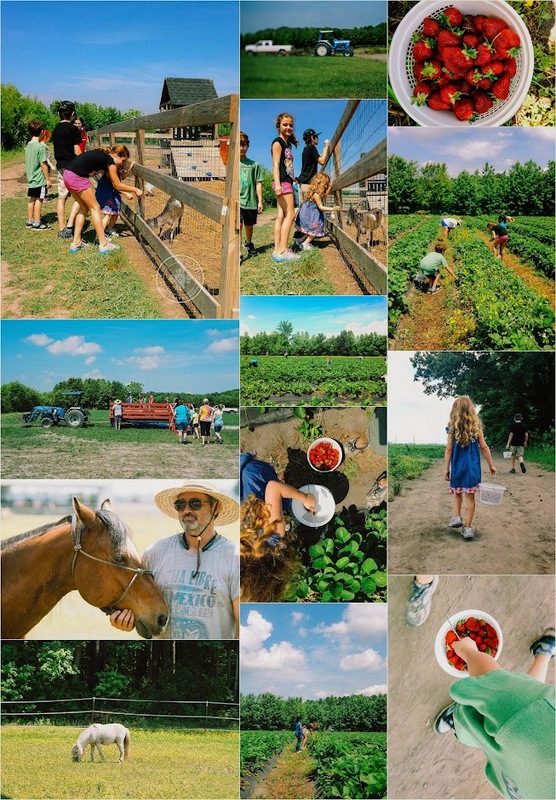 This week I ventured out with the kids to pick some berries at a local farm. It was tons of fun to get out of our ordinary routine and enjoy a little outdoor adventure. Though it was a hot, humid day, the kids loved visiting the farm animals and taking a hay ride. We brought home a bounty of beautiful ripe berries too - yum! We have since enjoyed smoothies, shortcake, ice cream topped with berries and my fave - sliced berries and cream. What's your favorite berry recipe? Thank you for stopping in! Have a safe and fun-filled Memorial weekend! Oh how delightful. We are growing our own strawberries, blueberries & raspberries. Still need to pick up some more bushes - but it's so fun to pick your own fruit!! What a great time! Have a safe & blessed holiday my friend - hugs. Looks like a fun outing - especially for the kids:) An many desserts thereafter! We did that, too, when I was a kid. Also peaches and green beans.